A bright field, connected over space and time. 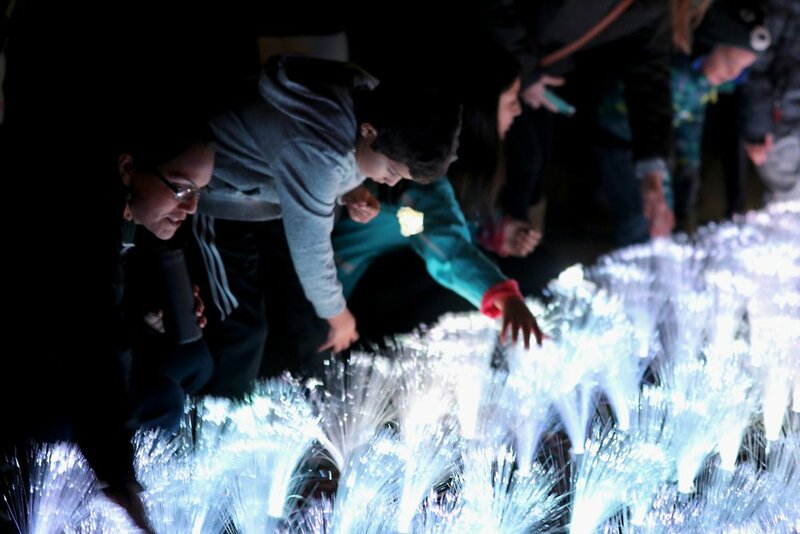 The piece evokes nostalgia in adults who grew up with fiber-optic toys and wonder and the younger children who have never seen such a sight, inviting all audiences to touch, sense and immerse in the brilliant light of the field. Exploring memory, presence and connection to nature and each other, “A Field of Light” is one my early investigation of a “proactive positive space”, a space that promotes open interaction and acknowledgment of our collective impact. A Field of Light is an interactive light installation that connects its audience across space and time. Made of an array of florescent fiber-optic flowers and surrounding motion sensors, the field responds to the presence of visitors, emitting waves of color from their location as they approach and linger. Even after viewers leave, their presence is remembered, and it echos through the fields in the minutes after their visit with ever fainting pulses of colored light. As more visitors approach, they are presented not only with their own impact on the field, but with the reminiscent light trails of those who came before.